So to set the stage, this game takes place during a Wildling invasion of the wall, so we're talking a couple seasons back and possibly beyond. As such the game board is modified so the Wildling invasion is felt by players, who must buy soldiers to place on the wall and prevent Wildlings from breaching through into the North of Westeros. 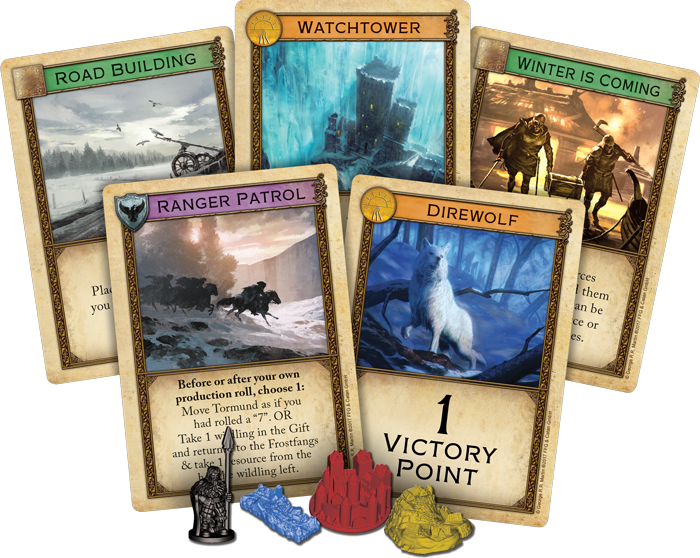 Ultimately, the game starts off as regular Catan, with the exception that all players roll an additional die each turn which affects the Wildlings and their movements heading up towards the wall. Adding troops becomes a necessity as resources begin to block up if a Wildling gets beyond the wall, and trolls can "kidnap" the earliest standing troop to make breaching the wall easier. If there are more troops than Wildlings attempting to breach a particular part of the wall the wall will stand, but there are specialized troops who can sneak by undetected and essentially act like an additional robber until they are taken care of. There are a fair amount of victory points at stake for having the most troops on the wall, so players will be rewarded for all their additional effort in stopping the Wildlings from reaching over. I'm not 100% sure on the rules and they aren't found online but I believe I remember the playtester saying that a Wildling breach on 3/4 sections of the wall at the same time results in an end of game and that victory points are totaled from that point with the highest earning player being the winner. This creates an extra depth of strategy in my opinion as someone going for "longest road," may not have a lot of troops on the wall, but ultimately if they build that road by the time the breaches happen they can still win. That said, with so many points at stake for having the most troops on the wall, ignoring it is not the right play. We only spent about 25 minutes playing a continuation of the last playthrough so I can't sit here and act like I know one strategy would work over the other. One additional mechanic that changes the game is the introduction of heroes in which each player begins the game with a notable Wildling, Night's Watch member, or some other Game Of Thrones person relevant to that storyline. Folks who grow tired of the non-stop negotiation of Catan will enjoy having heroes as their abilities speed up the game with some of their attributes. For example, Jeor Mormont allows a player to demand a 1:1 trade with 1-2 players for two resources. This allowed me to get a lot of ore quickly while passing off some wood and wheat that did nothing for me without them having anything to say about it. Each heroes ability is able to be used twice before a player has to switch it out for another 1-12 heroes, and each hero has some ability that benefits the gameplay in a manner such as that. By the end of the demo, my overall impression was that this wasn't just a Catan for people who like Game Of Thrones, but also one for people who want to play Catan but experience more action and faster gameplay. Having abilities to kind of force people into doing what you want knocked down negotiation phases drastically, which ultimately sped up the game a great deal...and i can't say it was worse for it. The buy in is a little pricey at a suggested retail of $79.99...but man with all those miniatures and the gameplay...it almost seems worth it. Pre-Orders are available now (In America) for $98.99 plus shipping...and if you're looking to take advantage of that deal I suggest you do so now before this one has trouble keeping stock. Deal: Get a Copy of SETTLERS OF CATAN for Under $30!